What’s the latest & greatest in cake ball world? It’s been so busy in the Cake Ball Workshop that Angie’s Cake hasn’t had time to show you many of the latest creations. I think the photos speak for themselves, so I will just…..show you the goods…. I did take a quick break from Cake balls to make some Oreo Cheesecakes to take to Thanksgiving. They are goooood. Then it was back to the goood ol' cake balls for the holidays! More to come shortly as I show you Two Be Wed‘s fabulous promotions. Check out their website; absolutely fantastic wedding coordinators, in my opinion. They are extremely professional with a fabulous team and many contacts in the industry. Every brides dream. I know you are all thinking about Turkey and dressing today, but it’s really time to think about the holidays and cake ball gift-giving! 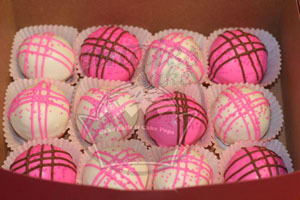 ← Customize your cake balls.